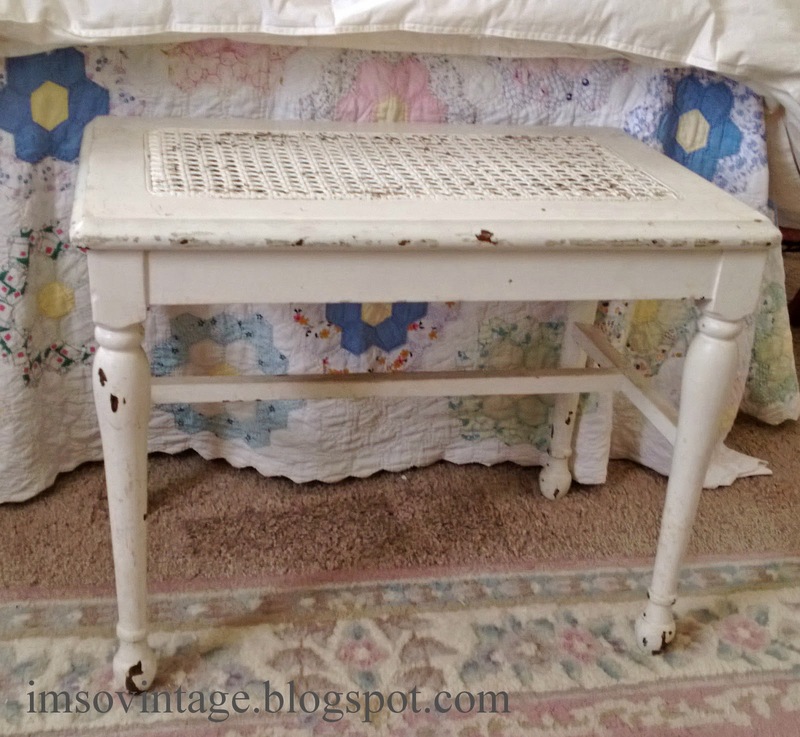 A few weeks ago I wrote about my new auction find here. 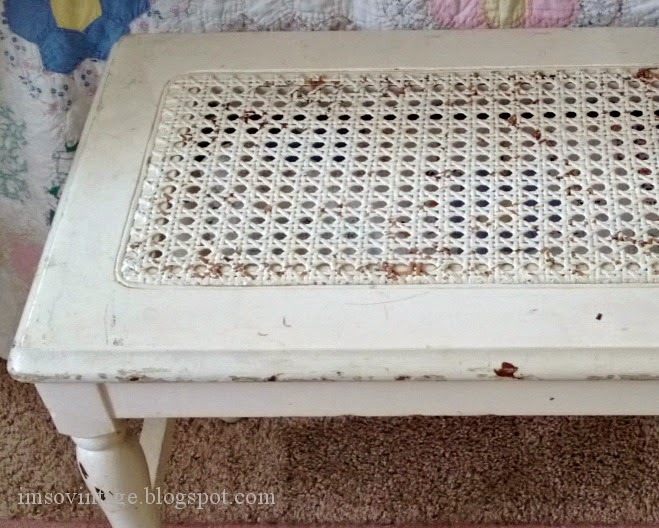 I absolutely love its chippy white worn look and it is working wonderfully next to my bed, but I knew I also wanted something new at the foot of my bed. 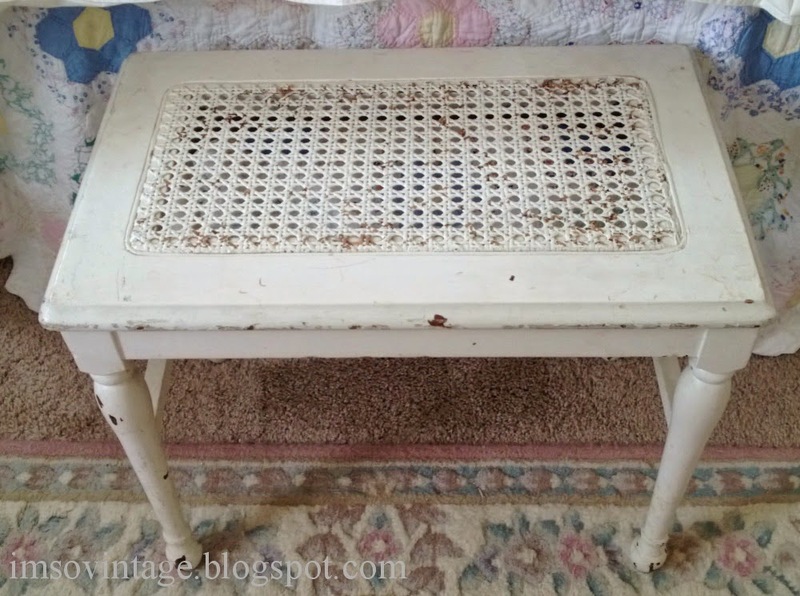 I had an old milk stool, which I love, but I wanted something that has a worn white look. So a couple of weeks ago when I was at the same auction where I found my table I saw this. It was definitely love at first sight and I was hoping I could get it for a reasonable price. I did. Fifteen dollars. Hooray!! So I brought it home and with just a little cleaning up it was ready for the end of my bed. It's perfect. Oh and I know some of you have asked about the quilt. I'll share that and the rug in some future posts. They were also thrifting finds. 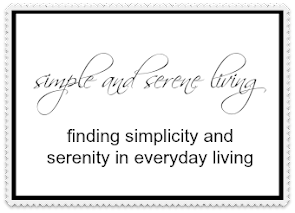 Another simple find for a simple and serene life. what a beautiful bench! Absolutely lovely, would have fallen in love either!!! Love it! Such a beautiful look for your room. Thanks, Jacqueline. I'm loving it. you did great - again! I love your white chippy finds! Good deals! Thanks, Judy. I love auctions. Lovely little bench! It looks very sweet! Looks so cute there. Another texture always helps. I just adore that lamp! you find the best treasures, the rug is lovely too, so is the quilt, looks really old! That little bench is perfect! I love chippy white furniture. I am just loving all the chippy white items I'm seeing these days. Gorgeous! I love mixing it in with my other wood pieces. I love your new bench! It's the perfect shade of white with just the right amount of chippy paint. Looks great at the foot of your bed. That's a piece you could use anywhere! I know. That's one of the reasons I love it. I can move it around if I want when I someday get moved back into my own space. I love the chippy look! I love it too, Laura. It reminds be of my Grandma's caned seat kitchen chairs! Previously when you said you purchased a bedside table I knew what it would look like before I got to the picture. It was exactly what I had envisioned. Now this table at the end of your bed is the perfect height. Well done, Laura! Sweet bench! I love it!